Currently, I can come down into it, but not hold the position. I want to hold the position for at least 5 seconds. In this picture, I am doing a twisted grip hand spring. I need to bring my legs down to the side to form an x with my arms and legs to perform the iron x – crazy abs for this one lol. 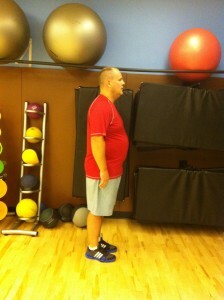 My name is Jason, I am 43 years old and I am obese. 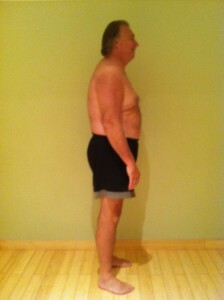 I am taking action to lose 25llbs of fat by December 17, 2012 because I am tired of being tired for no good reason. I was once considered a well-rounded athlete but in recent years my knees get sore easily, I was having difficulty walking an 18-hole golf course and I was out of breath tying my own hockey skates. With a sedentary office job that takes up to sixty hours of my time every week, I have not paid attention to my physical wellbeing or diet which has obviously caught up to me and is likely reflected in my high cholesterol and risks for heart disease. With the overwhelming support of my employer, family and friends, I recently made a commitment to make some significant lifestyle changes starting with my introduction to Elisabeth in June of this year. Since then, I have seen AND felt significant health improvements including loss of fat mass, improved cardiovascular fitness and the motivation to KEEP GOING!!! I hope to be buying a lot of new clothes for myself at Christmas!!! 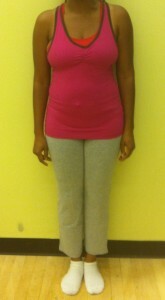 My main focus will be to lose 30 pounds in 90 days. As secondary goals I would like to see if by losing weight the stress on my knee’s will lessen and improve their strength and flexibility which we will estimate based on the measurements you have recorded with the leg press. I am hoping that in all areas my strength and endurance will improve and my capacity for aerobic activity will increase which will be measured by my walking on the treadmill. I currently can maintain a level of 4.0 for 15 minutes on the level 3 rolling setting during which I walk 1 Km in distance. I would like to be able to walk further and faster. 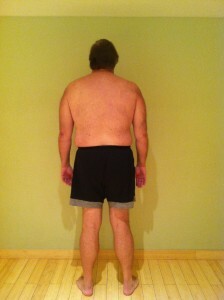 After you recorded my measurements I have set a goal to reduce my waist and chest measurements during this challenge. I also am hoping that my blood pressure will improve as a result of participating in this program. Currently my doctor always says I am borderline high blood pressure and he has even threatened that if it continues to stay at this level he would prescribe medication to reduce it. I have no desire to begin taking daily medication to manage my blood pressure so I am using this opportunity to improve my diet and renew my focus on 2 workouts with you and 2 separate workouts on my own each week. If I can lose 30 pounds in this 90 day challenge I’m confident that there will be many additional benefits to the weight loss much more important than not being embarrassed to remove my shirt for you to take my photo. I want to thank you for creating this motivational program and I will do my best to achieve these goals for the betterment of my overall health and welfare. 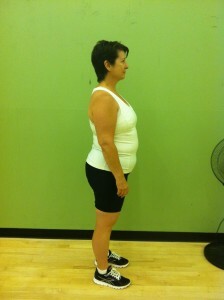 I actually started attending Elisabeth’s boot camp sessions last winter after a friend of mine suggested it. She had been attending them for a while and told me to try it out. My first response was “No Way!” I hate cardio and I didn’t think I would be able to keep up with the rest of the class. But I knew that I needed to make a change. I was frustrated that I could not lose the weight I’d gained after having my 2nd child and I hated the way I felt and looked in my clothes. I tried working out on my own, but never stuck to anything long enough to see results. I needed a push. Trust me; a ‘push’ is what you get in Elisabeth’s class! But I am definitely seeing results! I may not always keep up with the class, but I have accomplished my own personal goals and I want to keep going. I’m joining the 90 day weight loss challenge, not because I’m as concerned with the number on the scale, but because I’d like to decrease my percentage of body fat and lose that really annoying muffin top around my waist. It’s gone down quite a bit, but I’ve still got work to do! My goal is to lose 8% body fat and at least 4.9 inches off my waist by the end of this challenge. 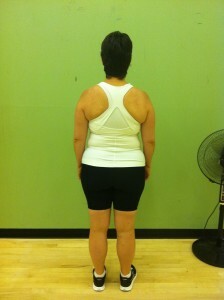 I am attending Elisabeth’s boot camp once a week and I’m also signed up for Pole Dance Level 1 in October. I’ll also be working on changes in my diet to help me achieve these goals. Wish me luck! Wants to lose 25 lbs of body fat. Long term goal – a 6 pack! 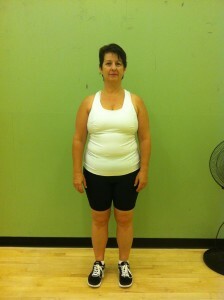 ‘I have been working out with Elisabeth since May 2012. 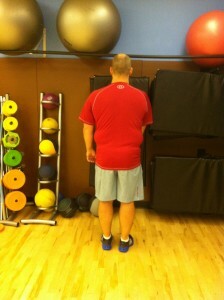 I started my program because I wanted to lose some weight and improve my running. Since the beginning I have lost inches and weight, my running has improved and I feel great. Elisabeth and I have also been working on my diet, and I can’t believe the changes that has done for me. 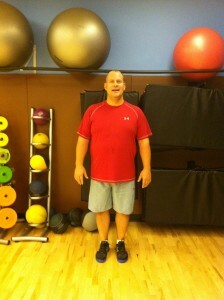 So far, I have lost 15 lbs and my challenge is to lose another 20 lbs by December. I am coming along nicely but thought this challenge would make sure that I continue improving and give me another reason to get to the gym for my workouts, get some more running done in the week and keep on my diet. I never walk away from our training session with anything less than a full sweat and feeling great. See you all at the gym.